I'm practicing 'being practical'.!!... Last Sunday, 3rd April, I volunteered to be a demonstrator for tatting at the Castle Hill Show. 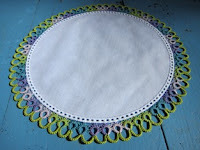 I thought to myself '...Right, I will get the doily that I have promised to make for a vase on Marijke's dinning table finished'. While working on the piece, I was also using it as an example to demonstrate tatting. To be sitting down tatting all day long, I couldn't not finish it.!! 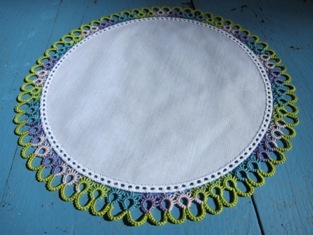 So, here is the finished doily for my dear friend, Marijke's vase. it's now packed away with other things that I will take with me on the trip to Europe next month.